This beer was a collaboration between Great Lakes Brewing out of Toronto Ontario and Phillips Brewing out of Victoria BC. 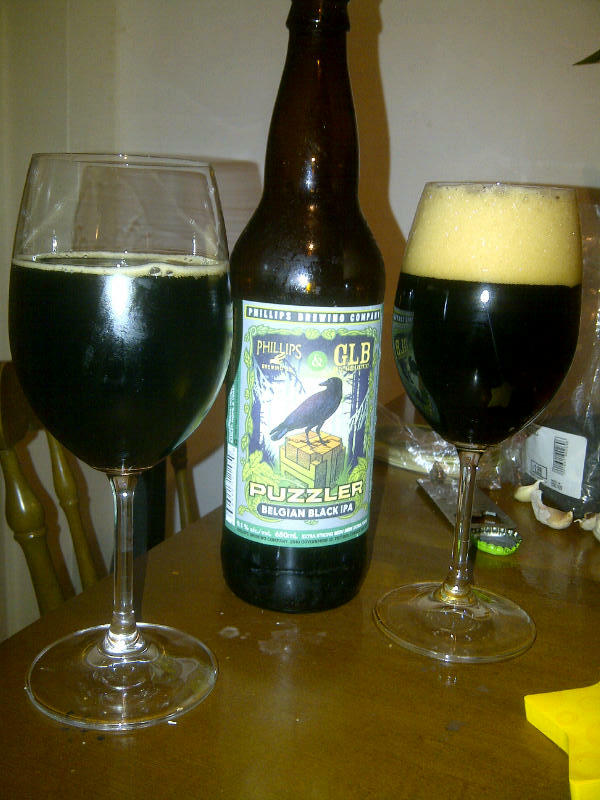 The “Puzzler Belgian Black IPA” was brewed at Phillips Brewery in Victoria BC. This IPA is a puzzler for sure as it pours an opaque black colour with a tan head much like what you would expect from a stout. The brew has the aroma of heavily roasted malts, citrus and herbal hops. The flavour of this beer is complex with heavily roasted malts, smoke, with a very slight tanginess (From Belgian yeast) and a big hops bitterness. This beer is very creamy with no alcohol flavour at all! The beer has an alcohol content of 9.1%. I would recommend this beer to fans of hopy beers as well as to fans of dark beer. It may be puzzling what it is but it is very tasty! This entry was posted in Cascadian Dark Ale (CDA) and tagged bc, beer, belgian black ipa, belgian style, belgian yeast, bitter, bitterness, black ipa, canada, citrus, great lakes brewing, heavily roasted malts, herbal hops, hops, hopy, IPA, malts, malty, ontario, phillips brewing, roasted malts, smoke, tang, tanginess, toronto, victoria.